The resurrection changed everything. "But for the resurrection," writes Mark J. Edwards, "there would have been no reason to argue for a union of two natures in the person of Christ, let alone for a dyad or triad in the Godhead. All that he had said and done in the course of his earthly ministry would have sat well enough with the character of a prophet who excelled such predecessors as Isaiah and John the Baptist only in power and closeness to God." That is the story that unfolds as Edwards gathers together the most salient comments from the early church on the latter half of the second article of the Nicene Creed on God the Son as the crucified and risen Lord. The deliberations of ancient Christian writers on these matters are regarded now as the nucleus of Christology. The work of Christ is customarily considered, in Western Christendom at least, as the principal object of his coming. That Christ died for our sins was an axiom of all apostolic preaching. In these pages we see that the doctrines of the Trinity and the incarnation were not the second thoughts of Christendom after its encounter with Greek philosophy. Rather they were forced on the church by its refusal to adopt the polytheism of the Greeks as a means of reconciling the sovereignty of God with the exaltation of Christ as Lord. It is ultimately in the work of Christ that the essentials of his Person are revealed. The church's early teachers ultimately combine to denounce the critical maneuvers that would persuade us that the Scriptures do not mean what they plainly say. Here, as throughout the Creed, we see how the early church rooted all its claims in Scripture. 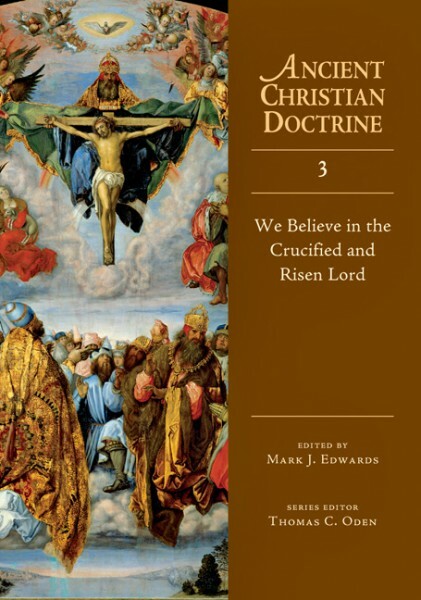 The Ancient Christian Doctrine Series: This exciting five-volume series follows up on the acclaimed Ancient Christian Commentary on Scripture to provide patristic commentary on the Nicene Creed. The series renders primary Greek, Latin, Coptic and Syriac source material from the church fathers in lucid English translation (some here for the first time) and gives readers unparalleled insight into the history and substance of what the early church believed. Including biographical sketches, a timeline of ancient Christian sources, indexes, bibliographies and keys to original language sources as well as the Nicene-Constantinopolitan Creed in Greek, Latin and English (ICET version), this series illuminates key theological essentials in the light of classic and consensual Christian faith and makes an excellent resource for preaching and teaching.